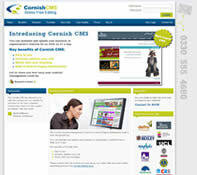 Cornish WebServices: What Is Content Management? The beauty of a CMS is that the management of a website can be handed over from designer to client, so that the client is able to easily make future changes to the wording and content of their own website. Cornish WebServices have created their own content management system, Cornish CMS, which is extremely easy to use and enables our clients to enjoy stress free website editing.